This post was brought to you by Jymy. Thank you Jymy. 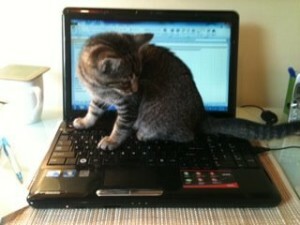 So…when you’re working and live with a cat or cats, do they like to help you work? Maybe they lay all over your papers, they are trying to keep them straight, in a pile, so they don’t fly away! Maybe you’re working on something and your cat walks across the keyboard, we all know it’s so they can get from point A to point B, but they think they’re helping you type up your dissertation, create that power point or spreadsheet. I sit in bed at night writing to you or sometimes getting some work done and undoubtedly Jymy walks right across the keyboard, sometimes she jumps over the laptop, but more often than not, like tonight, as the title shows, the keyboard. The picture even looks like Jymy as a kitten!